As a trusted partner, MSC Software helps companies improve quality, save time and reduce costs associated with design and test of manufactured products. Our products accurately and reliably predict how products will behave in the real world to help engineers design more innovative products - quickly and cost effectively. MSC Software's technology is used by leading manufacturers for linear and nonlinear finite element analysis (FEA), acoustics, fluid-structure interaction (FSI), multi-physics, optimization, fatigue and durability, multi-body dynamics, and control systems simulation. MSC Software Corporation is part of Hexagon, a leading global provider of information technologies that drive productivity and quality across geospatial and industrial enterprise applications. MSC Software Corporation was formed in 1963 under the name MacNeal-Schwendler Corporation (MSC). The company developed its first structural analysis software called SADSAM (Structural Analysis by Digital Simulation of Analog Methods) at that time, and was deeply involved in the early efforts of the aerospace industry to improve early finite element analysis technology. In 1965 MSC was awarded the original contract from NASA to commercialize the finite element analysis (FEA) software known as Nastran (NASA Structural Analysis). MSC pioneered many of the CAE technologies that are now relied upon by industry to analyze and predict stress and strain, vibration & dynamics, acoustics, and thermal analysis in our flagship product, MSC Nastran. Over our rich history, MSC has developed or acquired many other well known CAE applications including Patran, Adams, Marc, Dytran, Fatigue, SimXpert, SimDesigner, SimManager, Easy5, Sinda, and Actran. 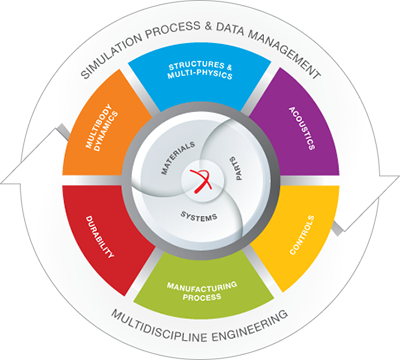 We are committed to the continued development of new CAE technology that integrates disciplines and technologies from standalone CAE tools into unified multi-discipline solvers and user environments. These “next generation” products enable engineers to improve the reliability and accuracy of their virtual prototypes by including multi-physics and multi-discipline interactions. MSC is also the CAE industry’s leader in extending simulation to the engineering enterprise. Our customers recognize the need to scale the benefits of virtual prototyping and testing from pockets of experts to mainstream engineering and product development, and MSC offers the only Simulation Data and Process Management platform in the world that has been successfully deployed in industries including automotive, aerospace, shipbuilding, electronics, and more. MSC Software currently employs over 1,400 professionals in 20 countries.